Mots-clés: Autophagy, Immunotherapy, Tumor Immunity, Hypoxia, Tumor Microenvironment. The TM research group operates in the Laboratory of Experimental Cancer Research (LECR) which is part of the department of Oncology at Luxembourg Institute of Health (LIH). The major aim of the TM group is to generate comprehensive, valuable and cutting edge knowledge to improve cancer immunotherapies, notably those based on immune checkpoint blockades. Therefore, the TM strategic priority meets the urgent need to improve the immune checkpoint blockade-based cancer immunotherapies, where impressive clinical results have been seriously challenged by observations showing that still high a number of patients reap short-term benefit or no benefit at all. The TM research group has gained an international position by showing that hypoxic stress in the tumor microenvironment activates autophagy as a resistance mechanism in tumor cells towards immunotherapies. 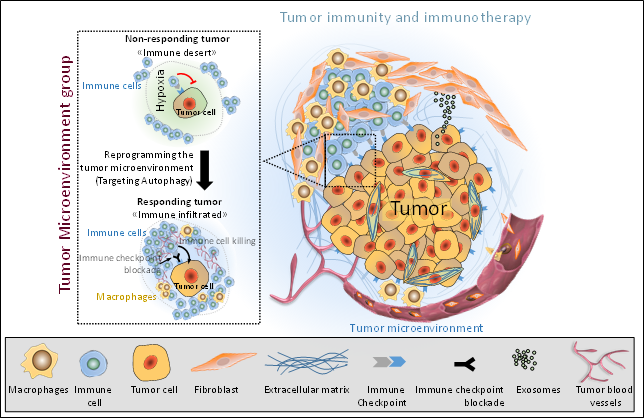 Currently the main objective of the TM research topic is to delineate the role of key tumor microenvironmental factors, notably autophagy, which can impair anti-tumor immune responses. The TM research group strives to develop appropriate strategies to target autophagy in order to reprogram the immunosuppressive tumor microenvironment to an immunosupportive one. The ultimate goal is to set up innovative combination strategies to improve immune checkpoint blockade based therapies. Through its basic research and clinically oriented aspects, the TM research group is involved in the establishment of appropriate and relevant pre-clinical mouse and in providing the proof-of-concept to set-up innovative cancer immunotherapy clinical trials. 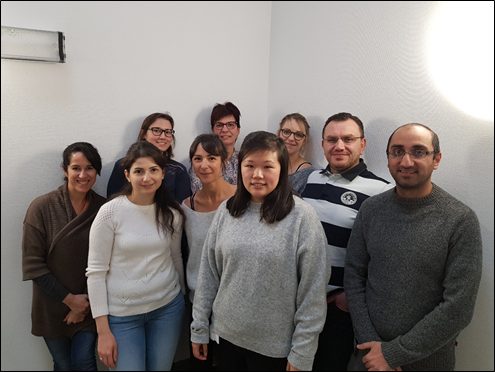 The TM group constitutes a host group for students of the doctoral school of Oncology « Ecole Doctorale de Cancérologie (CBMS 582) » of the University Paris-Saclay and Gustave Roussy Cancer Center and it is highly involved in training PhD and Master Students. • Mgrditchian, T., Arakelian, T., Paggetti, J., Noman, M.Z., Viry, E., Moussay, E., Van Moer, K., Kreis, S., Guerin, C., Buart, S., Robert, C., Borg, C., Vielh, P., Chouaib, S., Berchem, G., and Janji, B. (2017). Targeting autophagy inhibits melanoma growth by enhancing NK cells infiltration in a CCL5-dependent manner. Proc Natl Acad Sci U S A 114, E9271-E9279. • Viry, E., Baginska, J., Berchem, G., Noman, M.Z., Medves, S., Chouaib, S., and Janji, B. (2014). Autophagic degradation of GZMB/granzyme B: a new mechanism of hypoxic tumor cell escape from natural killer cell-mediated lysis. Autophagy 10, 173-175. • Baginska, J., Viry, E., Berchem, G., Poli, A., Noman, M.Z., van Moer, K., Medves, S., Zimmer, J., Oudin, A., Niclou, S.P., Bleackley, R.C., Goping, I.S., Chouaib, S., and Janji, B. (2013a). Granzyme B degradation by autophagy decreases tumor cell susceptibility to natural killer-mediated lysis under hypoxia. Proc Natl Acad Sci U S A 110, 17450-17455. • Baginska, J., Viry, E., Paggetti, J., Medves, S., Berchem, G., Moussay, E., and Janji, B. (2013b). The critical role of the tumor microenvironment in shaping natural killer cell-mediated anti-tumor immunity. Front Immunol 4, 490. • Noman, M.Z., Janji, B., Kaminska, B., Van Moer, K., Pierson, S., Przanowski, P., Buart, S., Berchem, G., Romero, P., Mami-Chouaib, F., and Chouaib, S. (2011). Blocking hypoxia-induced autophagy in tumors restores cytotoxic T-cell activity and promotes regression. Cancer Res 71, 5976-5986.